Residents gather at the scene of a suicide attack in Maiduguri, northeast Nigeria on July 17, 2017. A suicide bomber killed 13 other people in the northeast Nigerian city of Maiduguri on Sunday, a police official said, the deadliest attack in over a month as the conflict with Boko Haram stretches into its ninth year. That conflict, the epicentre of which is in northeastern Nigeria, is showing little sign of slowing, despite assurances by the government and military that Boko Haram is on the verge of defeat. 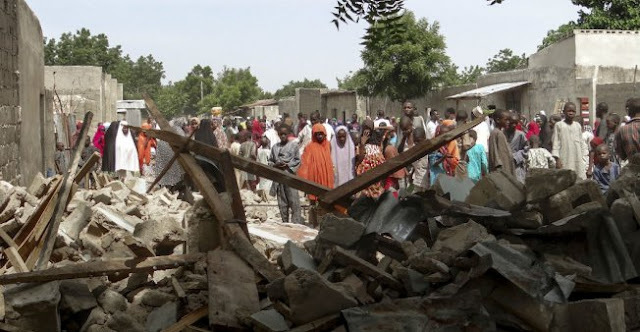 A suicide bomber killed 13 other people in the northeast Nigerian city of Maiduguri on Sunday, a police official said, the deadliest attack in over a month as the conflict with Boko Haram stretches into its ninth year. The evening attack, which also injured five people, struck the city’s Muna Garage area, Damian Chukwu, a police commissioner, told Reuters.